Do your resorts allow trailers, boats, motorcycles, RV’s on site? Each room is reserved one parking spot at no charge. Unfortunately, due to space restraints, we are not able to offer extra passes above the one parking spot per room. We are also unable to provide trailer parking at any of our resorts. Handicap and high top vehicle parking is available. Do your resorts offer free breakfast? Our Holiday Inn – “At the Pavilion” oceanfront resort proudly offers daily complimentary breakfast for all guests. Do your resorts have any on-site dining? Each of our hotels offers on-site dining options. Holiday Inn – “At the Pavilion” proudly offers complimentary breakfast daily for all guests at no extra charge and flavorful drinks and light grill items are served on the outdoor pool deck at the Tropical Paradise Beach Bar, open seasonally. Coral Beach Resort includes the Atlantis Restaurant, offering a full, hot breakfast buffet daily, and the Coral Bean Cafe’ proudly serves Starbucks coffee drinks and to-go items. The Splash Oceanfront Beach Bar & Grill, open seasonally, offers creative cocktails and a light grill menu. And the Oceans 6 Bar & Lounge features a full bar and food menu during the afternoon and evening. Sea Crest Oceanfront Resort features Beach Java Cafe’, serving breakfast seasonally and proudly brews Starbucks coffee. During the summer, a poolside grill offers lunch options. And the Malibu Beach Bar hosts live entertainment and karaoke in season. We’re sorry, but no pets are allowed at any of our resorts. However, exceptions are made for service animals, as defined by the American Disabilities Act (ADA), who are trained to provide assistance to guests with disabilities. What resorts have full kitchens? Each one of our resorts offers select rooms and suites with full kitchens. Full kitchens feature a full refrigerator, oven/stovetop, microwave, toaster, dishes, glasses, silverware, kitchen towels and dish soap, and a coffee/tea maker with complimentary coffee. What are your Resort Incentives? Resort incentives include our “Early Book” Savings Program, Free Stay Program and special offers including Military Appreciation Discounts. The resorts also offer Vacation Assurance protection and our Satisfaction Guarantee. In addition, from time to time each individual resort offers seasonal specials. Please visit each hotel’s website to find our additional information. What is the check-in age for your resorts? Room reservations are accepted from guests 21 years of age or older. Our hotel policy requires any guest under the age of 21 to be accompanied by their parent(s) staying in the room with them. What resorts offer the best indoor pools and amenities for a winter vacation? All three of our resorts offer heated indoor pools. Sea Crest Resort offers off-season guests an indoor lazy river, two relaxing Jacuzzis and a spacious indoor pool. Drift away on the indoor lazy river at the Holiday Inn – “At the Pavilion.” And, the Coral Beach Resort is home to a spacious indoor pool complex featuring a Roman spa, his and hers saunas, a children’s play area, and foosball and ping pong tables. In addition, the Coral Beach also offers the popular Entertainment Zone recreation center including 8 lanes of regulation AMF bowling, arcade games, pool tables, a snack bar and more. Do any of your resorts have Jacuzzi Suites? Yes. Our Tower Oceanview Junior Jacuzzi Suite at our Sea Crest Oceanfront Resort features one bath with a garden tub jacuzzi. Other features include a bedroom with one king bed, a living area with a double murphy bed, a full-service kitchen, two TVs and a private balcony. Check out our accommodations page for more details. What are the different areas of the Grand Strand? The Grand Strand is made up of many cities and towns stretching from the North Carolina border to Georgetown and is separated from mainland South Carolina by the Intracoastal Waterway. The Northen section of the Grand Strand includes Little River, Cherry Grove Beach, and North Myrtle Beach, before reaching the popular resort destination of Myrtle Beach. South of Myrtle Beach is Surfside Beach, Garden City Beach, Murrells Inlet and Pawleys Island before reaching the Waccamaw River and Georgetown. How does the city parking work? Parking meters are located in high-demand areas, including near the beach and the Myrtle Beach Boardwalk, with many meters offering all-day parking and others offering short-term options. A green 24-hour sticker on the meter indicates all-day parking while red stickers indicate short-term parking. Depending on location, hourly rates will vary. Meters are in effect from March 1 to October 31. Call (843) 626-7275 if you have further questions about parking in Myrtle Beach. What airlines and airports are in the area? Myrtle Beach International Airport (MYR) is the primary full-service airport that serves Myrtle Beach and the Grand Strand. MYR is located between Coastal Grand Mall and the Market Common in Myrtle Beach, and just minutes from the beach. Select airlines servicing MYR are Allegiant, American, Delta, Porter, Spirit, United, and WestJet. Call (843) 448-1589 for more information. 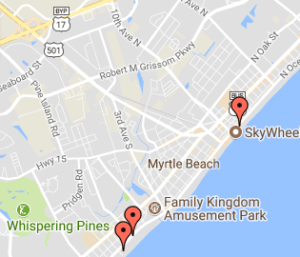 Where can I rent a car in Myrtle Beach? Many car rental companies are located at Myrtle Beach International Airport, including Hertz, Alamo, Enterprise, and Budget. There are also plenty of other options located throughout Myrtle Beach. Otherwise, guest services can assist you with hailing a taxi during your stay. What types of public transportation are available in Myrtle Beach? If you’re in need of public transportation, you can catch a ride with Coast RTA, a bus system with regularly scheduled routes servicing both Horry and Georgetown County. Coast RTA has many stops throughout Myrtle Beach. You can call Coast RTA at (843) 488-0865 for more information. Where can I go if I have a medical emergency during my vacation? There are two hospitals located on each end of Myrtle Beach: Grand Strand Medical Center (843-692-1000) off of 82nd Avenue N. and Highway 17 Bypass N. and South Strand Medical Center (843-839-1000) located off of US Highway 17 Bypass S. between Myrtle Beach and Surfside Beach.